I have been collecting material on the life and works of Lewis Carroll for over forty years now, and last July I took part in a panel discussion at the National Library of Scotland on the subject of marketing children’s books. 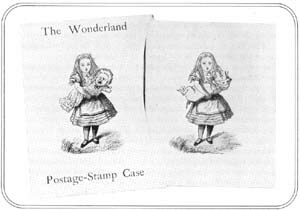 My brief was to demonstrate how Lewis Carroll and his publisher Macmillan set about marketing the Alice books around the end of the nineteenth century. Mulling through possibilities for illustrative material from my collection, I thought of the special binding of particular copies of the Macmillan People’s edition, and the Sixpenny Series of Alice’s Adventures produced for sale in the theatre foyer at the 1903 production of the Alice play. Macmillan marked the expiry of the copyright of Alice’s Adventures in 1907 by issuing several new editions, publicising them with a Punch cartoon captioned ‘Tenniel’s Alice reigns supreme’. This search through my bookshelves triggered many memories from a lifetime’s Carroll collecting. 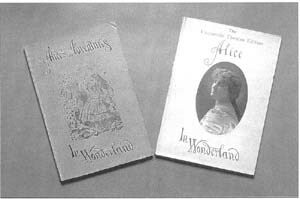 Above:Macmillan’s Sixpenny Edition (1898) and the Vaudeville Theatre Edition of Alice’s Adventures in Wonderland. First to come to mind was a choice occasion quite a few years ago at an Antiquarian Book Fair in Scotland:on the stand of an eminent Edinburgh book dealer, I spotted a copy of the 1869 edition of the first French translation of Alice’s Adventures in Wonderland, priced at a modest £20 and described as a ‘later issue’. In fact, it was a pre-publication binding – recognisable by being taller than the actual first edition, and with uncut edges. As far as I know there are only two other examples. Astonishingly, a few years ago I had another piece of good fortune concerning this first French edition, when a friend brought along a copy to a meeting of the Lewis Carroll Society. At first glance it looked exactly like the Macmillan blue cloth first edition – until I noticed the imprint – Hachette, Paris. The existence of this variant was not unknown to collectors, but no example in the original binding had surfaced. In such a ‘one-off’ situation it is particularly hard to judge what might be a fair price, but happily my offer was accepted, and I had acquired a very desirable item for my collection. There is a popular misconception that bargains at specialist book fairs do not happen these days. In my own experience this is far from the case. Only a couple of years ago, at the Harrogate specialist Children’s Book Fair, I found a copy, priced at £20, of the rejected 1893 ’60th thousand’ of Through the Looking-Glass, complete with the special purple stamp on the title page ‘Presented by the Author for the use of Mechanics’ Institutes…’ Over the years I have compiled a census of this edition:there are eleven known copies. This was a case of lightning striking twice – I bought my first copy of this rejected issue for £5 from a Newcastle book dealer in the late 1960s; at that time there were only two known copies. That Newcastle purchase was a key event in my collecting life. In the same locked glass case at the back of the shop was a copy of the 1866 first published edition of Alice’s Adventures, in the original binding, and with the bookplate of the original Alice’s son, Caryl Liddell Hargreaves. I was a young doctor, only just starting out as a General Practitioner, and barely able to afford the £40 price tag. Luckily I had enough to put down a deposit, and returned the next day to complete the purchase. I am glad I did. A lesser copy of this edition was sold at a recent Sotheby’s sale for over £5000. 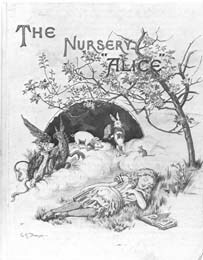 Right:The Nursery ‘Alice’, 1889, a retelling with twenty of Tenniel’s illustrations (coloured), and a cover by Gertrude Thomson. A later issue spotted in Old Town Books, Victoria Street, Edinburgh, is dated 1889 but priced at both 3/- and 1/-. Sometimes things happen quite serendipitously. On a Beatrix Potter Society trip to Shrewsbury we had time to scour the local bookshops during the lunch break. I found for £5 a copy of Sylvie and Bruno Concluded, 1893, (Lewis Carroll’s late ‘failure’). Not a rare book – until I noticed it was another example of a special binding for presentation to Mechanics’ Institutes. One needs to know what to look out for:the note about the special presentation embossed in blind on the front cover is not necessarily immediately noticeable in a ninety-year old book. However, this issue is even rarer than the rejected Looking-Glass; only six copies have been recorded. On another occasion, a dealer had for sale two copies of Sylvie and Bruno:one was the standard first edition of 1889, not an uncommon book; the other was being offered at half the price, because it had advertisements at the end dated 2.10.91. The dealer was unaware that such a copy was completely unrecorded at the time. I was delighted to be able to buy it – and write up the curiosity for the Carroll Society Journal. About fifteen years ago I called at a bookshop in Sedbergh in Yorkshire and bought an early copy of The Tale of Peter Rabbit for £25. On returning home I was more than pleased to discover that it was the second issue of the first published edition. An almost identical copy sold at Sotheby’s in July 2002 for £5900. Talking of auction houses reminds me that even they can occasionally nod. I once bid for two fairly routine reprints of editions of the Alice books – both dated 1884. I paid about £15 for the two, which was not bad, as they were in beautiful condition. Later, when I had the chance to have a good look at them, I flipped through the Alice in Wonderland and out fell a mint copy of the rare 1884 reprint of Carroll’s leaflet, An Easter Greeting, followed by the 1884 Christmas Greetings. I picked up Looking-Glass - no, it couldn’t happen again. It did! Mint copies of the two leaflets again fluttered to the floor. It would appear that the leaflets had been inserted by the publishers back in 1884, and had laid undisturbed ever since, until they came into my possession. Another important find at auction happened at a Sotheby’s sale devoted to a single collector’s collection of autographs. Buried in the middle of this sale were two separate issues of Lewis Carroll’s leaflet Lanrick, providing rules for a board game – both with ms notes by Lewis Carroll. I bought these for a ridiculously low sum. Presumably the lack of competition was because they were not in a special Lewis Carroll sale. 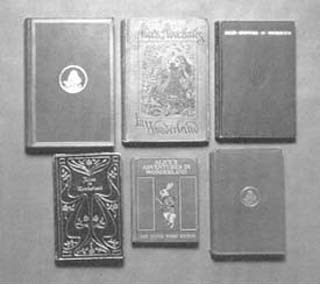 Above:Editions of Alice issued by Macmillan in response to the expiry of copyright (clockwise, from top left):The standard 6/- Edition. The People’s Edition, 1887. The Illustrated Pocket Classic, 1904. De Luxe binding for the Miniature Edition, 1907. Little Folks’ Edition, 1903. Miniature Edition, 1907. Such episodes are really just the icing on the cake of collecting, but they add zest to the chase. You just never know when they are going to happen. Of course, the reverse can also occur. On occasion I have spent far more than I should on items that seemed at the time highly desirable, but were simply not that valuable. I turn, in Carrollesque fashion, to the comforts of mental arithmetic:add the extremes together and divide by two – then it works out just about right. ‘Lewis Carroll’s Rejection of the 60th Thousand of Through the Looking-Glass by Selwyn Goodacre:The Book Collector, summer 1975. ‘Notes and Queries – Sylvie and Bruno’ by Selwyn Goodacre:Journal of the Lewis Carroll Society, winter 1977. ‘A New Look at Lewis Carroll’s Easter Greeting’ by Selwyn Goodacre: Journal of the Lewis Carroll Society, summer 1985. 16 Comments on "Serendipitous Collecting"
Dear Mr Goodacre. David Miles suggested I contact you. I am a dealer in London and would value your opinion on what may be an excellent Carroll manuscript item. Could you get back to me at the above email so that I can send you more details, please? Both are in good condition for their age. I was wondering if you could offer any further details about the books such as how best to store them and guide price/value. David Chambers, a great friend of mine, has just published a new book on the Daniel press and is working on a general account of priavte presses before Kelmscott. Lewis Carroll owned a palour press; was it used for any of his publications? Some of those in Crutch have no imprint, but this point seems not to be addressed therein? Did Lewis Carroll use his palour press for any of his publications? hello again- just collected my book in london. it is the real deal- cover embossed [!] with the “presented etc”. then sixtieth thousand and 2 pages of catalog at the back. I have 1899 Alices adventures. Could you give me an idea of it’s worth?